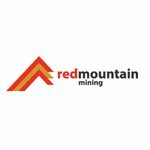 Red Mountain Mining (ASX: RMX) is rapidly progressing its cobalt ambitions at the Mukabe-Kasari Cobalt-Copper Project in the Democratic Republic of Congo (DRC). The DRC, and in particular the prolific Central African Copper belt, is the world’s largest supplier of cobalt. The Mukabe-Kasari Cobalt-Copper Project offers significant potential and has artisanal mining that has already demonstrated mineralisation at the location. The project is located in the Congolese part of the prolific Central African Copper belt, comprising artisanal licenses over approximately 116 square kilometres. 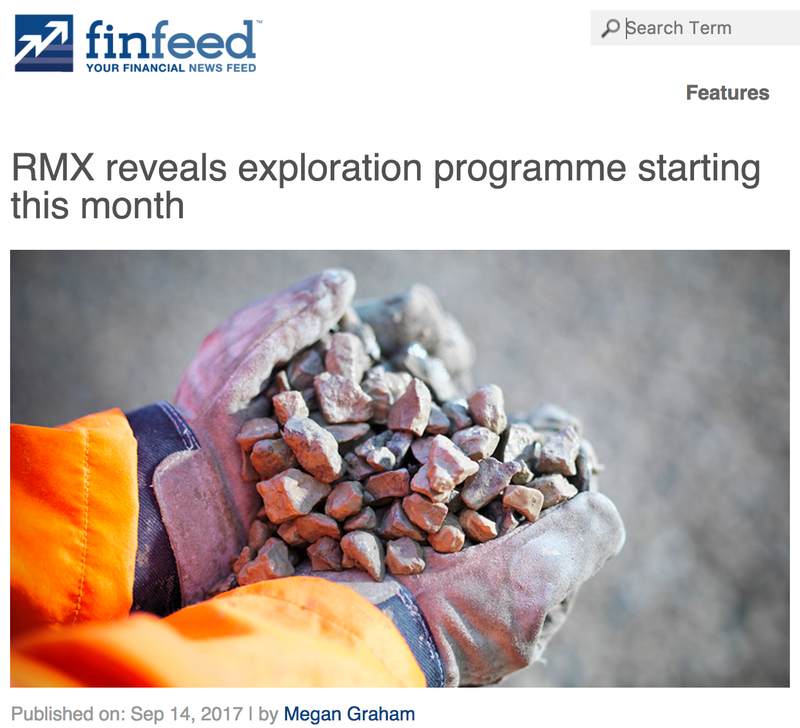 RMX now has its due diligence on the project complete, funding secured, and an exploration programme designed, and intend to commence a systematic exploration programme by the month’s end. RMX designed the exploration programme at the Mukabe-Kasari Cobalt-Copper Project with the assistance of its technical advisor CSA Global Pty Ltd. The company has also completed a capital raising of $735,000 to help fund exploration, and completed due diligence on the tenure package to ensure there’s opportunity for sufficient scale, assess geologic prospectivity, and scope future exploration work. The exploration programme will see RMX follow up on its due diligence work which identified excellent cobalt and copper grades at surface. The upside for RMX here is that no previous systematic exploration has been conducted in the project area, meaning this could be an open book for the company. Keep in mind that it is early stages here and investors should seek professional financial advice if considering this stock for their portfolio. The Mukabe-Kasari Cobalt-Copper Project area is located in the Congolese part of the prolific Central African Copper belt, comprising 12 artisanal licenses over approximately 116 square kilometres. The project is situated approximately 250km northwest of Lubumbashi and 70km north of the giant Tenke-Fungurume Copper-Cobalt mine. It is approximately 150 kilometres from Ivanhoe’s Kamoa-Kakula project, a stunning and recent world class Copper discovery. The due diligence included a short reconnaissance site visit by RMX’s technical advisor, CSA Global Pty Ltd, who carried out validation ground-work across the tenure package to ensure there’s opportunity for sufficient scale, assess geologic prospectivity, and scope future exploration work. The below samples were taken, including cobalt grades of up to 0.5%. RMX also announced that it had completed it share placement , receiving firm commitments from professional and sophisticated investors to raise $735,000 (before costs) via the issue of 66,818,182 new fully paid ordinary shares. The funds raised will go towards earn-in exploration activities at the Mukabe-Kasari Cobalt Copper Project, ongoing identification and due diligence on additional asset and project opportunities, as well as general working capital and costs of the offer. The Mukabe-Kasari Cobalt-Copper Project area overlies the slopes of the Katanga Plateau where gently folded sedimentary strata of the Upper Nguba and Lower Kundelungu formations are outcropping. Secondary copper-cobalt mineralisation (malachite, azurite, chalcocite and heterogenite) as disseminated and strata-parallel mineralisation was mapped. Significant secondary cobalt mineralisation was also sampled in palaeo-channels. The mineralisation occurs on the periphery of the Lufilian Foldbelt of the Congolese Copperbelt which historically was not considered to be mineralized. However, the mineralisation in the Mukabe-Kasari area shows all the typical properties and the geological setting of sediment-hosted copper-cobalt mineralisation. During its due diligence, CSA Global established that the mineralisation was hosted in at least one, possibly multiple, gently-dipping, interbedded and weathered shallow-marine siltstones and sandstone layers. Mineralised layers up to 1.4m in thickness were recorded at surface. Disseminated grains and stringers of chalcocite within sandy beds were common and probably represent weathering products of primary sulphide mineralisation. Anomalous supergene cobalt mineralisation was sampled in several artisanal pits dug into old riverbeds and sampled at a depth of 7 to 9 metres below surface. The mineralisation is open at depth. There was no copper mineralisation observed with this type of mineralisation. 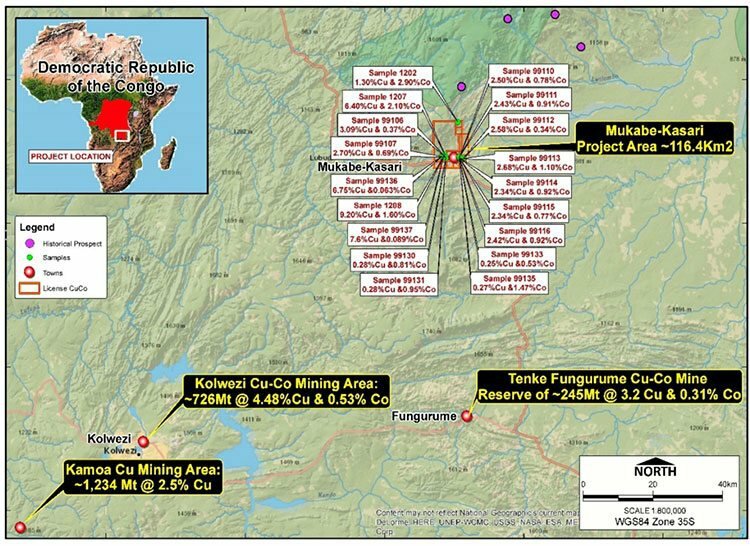 This technical due diligence conducted by CSA Global Pty Ltd concluded that the Mukabe-Kasari Cobalt-Copper Project area is sufficiently prospective to warrant systematic exploration work to assess the full prospectivity and the potential of the area to host economic copper-cobalt mineralisation. 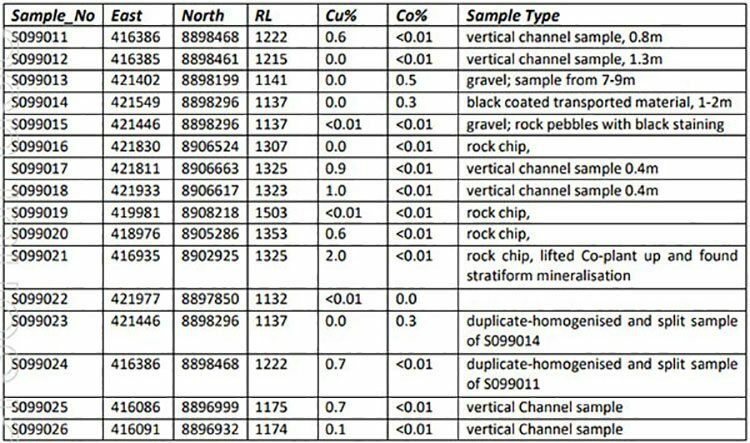 Several highly anomalous copper and cobalt sample analyses and the discovery of several new locations of outcropping mineralisation resulted from this assessment. 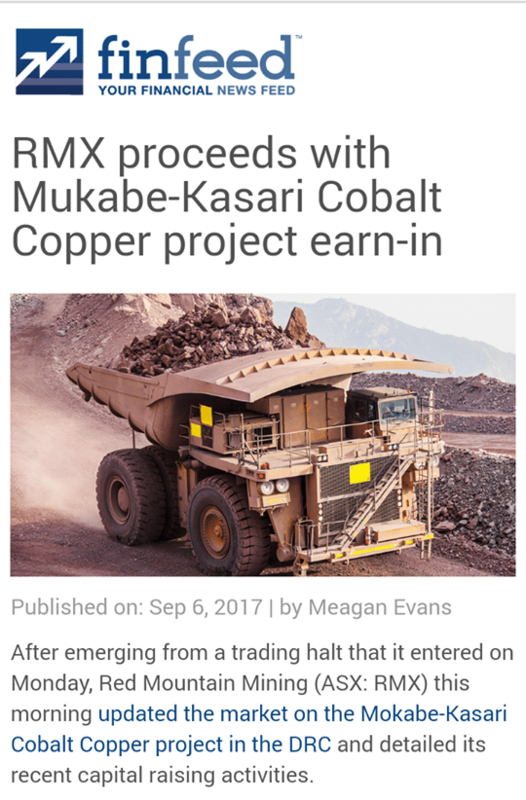 On September 6, RMX announced that it was proceeding with its earn-in agreement in regards to the Mukabe-Kasari Cobalt Coper Project . RMX was encouraged by the results of its final due diligence on the project, and on this basis decided to proceed with the earn-in to acquire up to 90% of the project in the world famous central African Copper belt. The final stages of RMX’s due diligence took longer than planned. It wasn’t all bad however, as the delay did provide RMX the opportunity to renegotiate the economics of the staged deal. Until now, no systematic exploration has been conducted in the project area. That’s all set to change shortly, with work programmes having been designed to test the copper-cobalt and cobalt only mineralisation targets that were identified during due diligence. The overall objective of these programmes is to define targets for RC (reverse circulation) or diamond drilling. The copper-cobalt mineralisation area will be targeted with a systematic geochemical surface sampling and pitting programme to establish the lateral extent of mineralisation, the number of mineralised beds and thickness of individual beds. 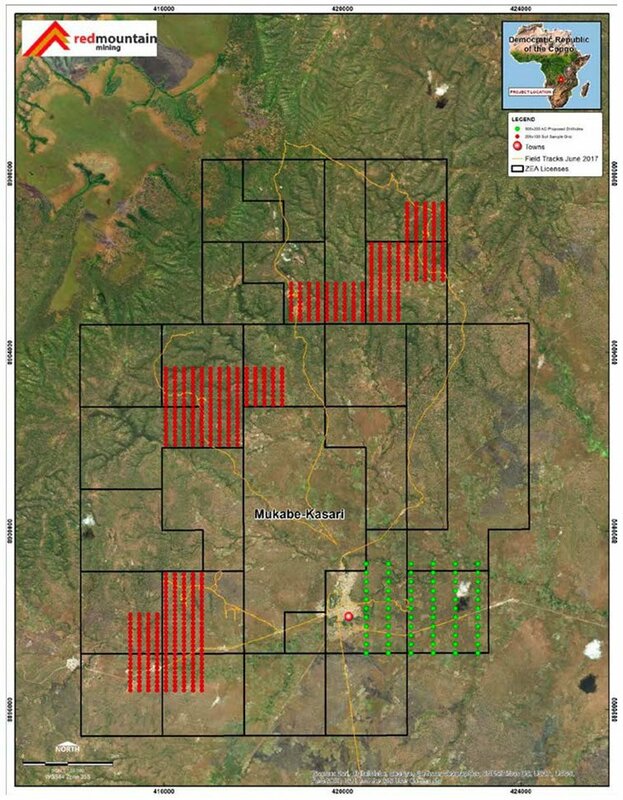 An AC (air core) geochemical drilling programme is planned for the cobalt mineralisation area. The objective is to determine the distribution, grade and host rock properties of this target area. The holes are planned to be drill on a 500 by 200 metre grid and to a depth of 20 to 30 metres. A total of approximately 1,000 metres of drilling is budgeted. RMX’s technical advisor, CSA Global, has reported that the mineralisation at the project is hosted in at least one, possibly multiple, gently-dipping, interbedded and weathered shallow-marine siltstones and sandstone layers. Mineralised layers up to 1.4 meters in thickness were recorded at surface. The exploration plan stipulates work programmes designed to test the copper-cobalt and cobalt-only mineralisation targets, with the aim of defining targets for drilling. It should be noted that this is an early stage play and anything can happen, so seek professional financial advice if considering this stock for your portfolio. While the Mukabe-Kasari Cobalt Copper project is currently receiving most of the attention, RMX continues to progress its Red Valley Lithium Brines Project in the US state of Utah. In late May, RMX published an update on it progress at Red Valley . Progress on drill hole 2 at the project was slower than had been anticipated due to inclement weather, including unusually late snowfall. Additionally, a hard basalt aquifier zone was encountered at 130 feet with higher than expected amounts of water overflow which ultimately caused a loss in circulation to the open hole rotary drill. To address this, the drill was converted to a Reverse Circulation (RC) system and the Robit casing advanced tooling system was implemented. This new strategy has meant further time delays, but that said, the most recent update from onsite personnel has been very positive. RMX, along with its JV partner, has decided to extend hole 2 to a depth of 1300-1500 feet to test and determine the maximum amount of water producing zones available. While drilling is ongoing at Red Valley, the major focus remains on the huge potential in the DRC and its highly prospective Mukabe-Kasari Cobalt Copper project. RMX is well funded following the successful completion of its capital raising, and with its exploration programme planned, it is looking forward to commencing Phase 1 exploration activities at the Mukabe-Kasari Cobalt Copper project. The company is also keeping an eye out for complementary assets for acquisition as it continues to review new opportunities in the new energy metals, base metals and gold sector.